A Journey by Boat Essay. Welcome to our website. This is the one of the best and an unlimited the source of Essay and Paragraph. 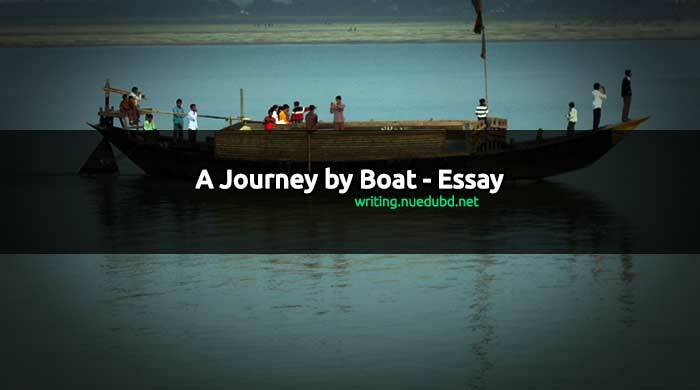 Now NU EDU BD writing section sharing the most useful A Journey by Boat Essay for you. I hope you'll like it. Education is one of our basic rights. Now check this out. Introduction: Bangladesh is a land of rivers. Here a journey by boat is very easy. One can enjoy the beautiful atmosphere and nature of a boat journey. A large part of our country sinks under rainwater. At that time, different places can be visited by boat. Last autumn vacation. I got such an opportunity to make a journey by boat. Preparation: Our College was closed on the Puja vacation last autumn. I along with some of my friends decided to go on a journey by boat. The date and time were fixed. We hired a big boat. We took our necessary luggage and food. Accordingly, we reached the river ghat on the fixed date. Beginning of the journey: It was a bright sunny day, The atmosphere was calm and cool. There were few patches of clouds on the sky. We got on the boat. There were a helmsman and two oarsmen. All of them were experienced and strong. The boat stared at 8.30 p.m. with oars. Description: The river was calm We were in exiting mood. It seemed we were going to plunge ourselves into the ocean of enjoyment. The boatmen started singing palligeeti. The murmuring sound of the river along with the sound of the oar created a combination of excellent musical tone. The boat was moving speedily on the favorable wave. The total atmosphere was bathed with excellent beauty. The open fields, green crops etc. created the eye-dazzling sight. The cottages of the riverside villages with clusters of trees beside them offered a very fantastic look. We saw the village women bathing in the river and carrying water. Fishermen were fishing. Birds of various species were hovering over our heads. The beautiful rural atmosphere cast a spell upon our minds and we were struck dumb. After four hours, our boat reached near a small bazaar. We got down from the boat. We decided to cook food. Some of my friends went to the bazaar and bought rice, vegetables, and fish. There were cooking equipment for the boatmen on their boat. One of the oarsmen was an excellent cook. He cooked deliciously and after eating, we resumed our journey. The boatmen again started singing. We felt sleepy with a gentle breeze. The songs of the boatmen also lulled us too sleepy mood. However, we resisted our sleep and engaged ourselves in sucking the beauties all around.